Gee, I wish I had a puffer coat evening gown ... said no one, ever. The bulky winter outerwear staple doesn't exactly evoke images of haute couture fashion. In fact, it usually reminds us of that moment from "A Christmas Story" when Randy can't move his arms because he's so bundled up. Alas, Italian fashion brand Moncler is making the fashion hybrid happen — and dare we say, it's pretty neat. The brand's 2018 collection is an homage to the puffer coat and even dares to re-create it in evening gown form. We're all for genius combos — cronuts, anyone?! — but fusing an elegant evening gown and a utilitarian puffer coat together is more than a bit surprising. On the one hand, you've got a warm, cozy, practical article of clothing that shields you from the winter elements. And on the other, you've got a dazzling piece of couture that doesn't offer much in terms of warmth. Yet, somehow, Moncler made it work by paying tribute to the puffer coat in all its forms in its new collection. They're now selling an embellished cinched-waist puffer coat, a down-quilted puffer cape, long puffer gloves, and a sleeveless puffer evening dress, available in pink and blue. If you've always dreamed of rocking a puffer dress, it'll set you back a whopping $2,710. And you'd have to get in line for those long puffer gloves ($1,500), because they've already sold out. 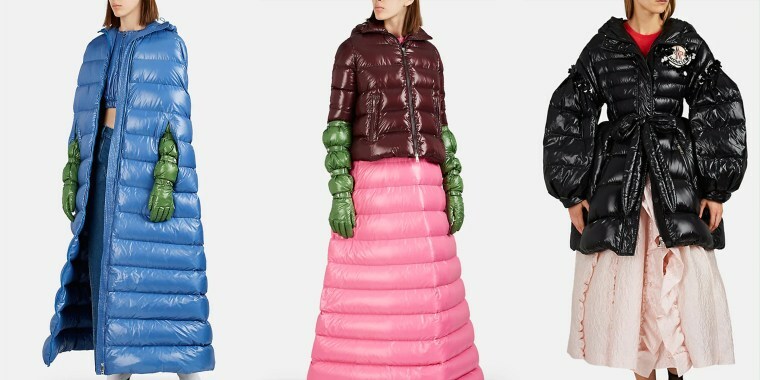 In case you're wondering how to accessorize your new puffer gown, you're in luck because Moncler offers a few options in their product photos, including one that layers another puffer coat over the puffer dress. We first caught wind of the puffer gown trend last February, when actress Millie Bobby Brown showed up to Milan Fashion Week rocking a Moncler x Simone Rocha puffer coat gown. Most recently, fashionista Monica Almada was spotted in New York City rocking the blue Moncler puffer coat evening gown, as StyleCaster reported. Whether the trend catches on and hits a store near you is hard to tell, but one thing's for sure: puffer coat evening gowns prove that anything goes when it comes to style in 2018.